Ibiza restaurants provide an enjoyable place to dine on this island, with some delicious food available. When dining in Ibiza restaurants, tavernas, cafés and bars, the food is based on a combination of fresh produce and home cooking, with the result being quite delicious. Ibiza is ideally placed for the freshest seafood and fish. High quality Spanish fruit and vegetables are also readily available, and so restaurants in Ibiza are able to obtain a wonderful array of fresh ingredients when preparing their meals. Breakfast in Spain tends to be eaten twice and Ibiza is no exception. The first breakfast is usually a light meal, such as toasted bread with butter, jam or olive oil, together with a milky coffee (café con leche). A little later, sometime between 10:00 and 11:00, a more substantial breakfast follows, usually in a café. This often consists of a sandwich (bocadillo) or muffin (mollete), with either ham, cheese, sausage or a slice of traditional Spanish omelette. Churros are also popular for breakfast in Ibiza and these are simply fried dough strips, sold mainly from stalls around the streets of towns on Ibiza. Lunch in Ibiza starts from 13:00 onwards, usually with tapas. These are bite-sized snacks that accompany drinks and they are a real part of Spanish culture and very popular in the city. The tapas bars (tascas) can become very busy and they usually have plenty of atmosphere. Tapas started in the 18th century when Carlos III asked for his wine to be covered with a plate of food, to stop the dust from getting into it - 'tapa' literally means 'lid', which is where the name comes from. These days, the most common types of tapas include snails, deep-fried squid, mushrooms, baby eels, tripe, prawns, cold potato omelette, meatballs, potato salad, olives, cheeses, cold meats and tortillas. A meal in a tapas bar or café in Ibiza is a very social way to enjoy and share a large variety of food and different tastes. Lunch in Ibiza is eaten between 14:00 to 15:00 and is usually followed by an afternoon siesta. A typical lunch menu in a Ibiza restaurant might consist of fideua (a tasty paella made with noodles and various types of fish and crab), sofrito ibicenco (a mixture of chicken, lamb, sausages, potato and liver), serviola a la mallorquina (a baked fish dish served with tomato sauce, raisins and pine nuts), codorniles emborrachados (succulent partridge roasted in a clay pot with wine and brandy), lobster, many salads and hearty soups. Bars and beachside restaurants are great places for snack food throughout the day. 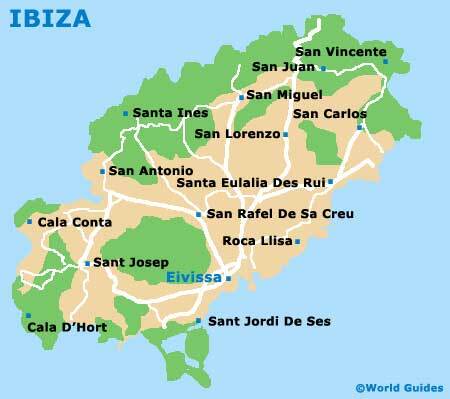 Dinner on the island of Ibiza usually starts at around 21:00, when Ibiza restaurants begin serving supper, although some restaurants in Ibiza may open a little earlier for tourists. 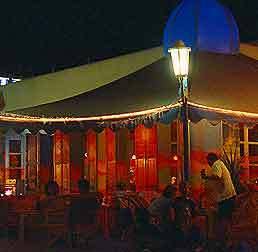 The restaurants usually stay open until after midnight and many locals in Ibiza enjoy dining out in restaurants on a regularly basis. Ibiza restaurants tend to fill up for Sunday lunch and so booking is essential at this time.